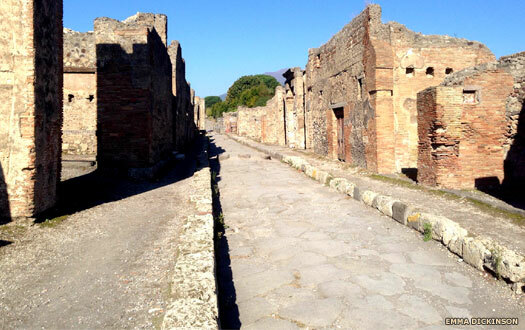 Was Pompeii destroyed by falling pumice and ash, and Herculaneum by slow-moving flows of boiling mud? Were Pompeii's victims killed by falling rocks, collapsing roofs, and suffocation inside rooms that were buried by the deluge? Did all of the people of Herculaneum, on the other hand, escape? That's what used to be thought at least, but between around 1980-2010 vulcanologists were able to challenge the traditional view of the eruption. Combining the evidence of Pliny the Younger's letters, the study of exposed volcanic strata in the Bay of Naples, and the experience of other eruptions such as that of Mount Pelée on Martinique in 1902, they were able to develop a new - and far more terrifying - account of what actually happened on 24-25 August AD 79. The Romans knew that Vesuvius was a volcano, but they thought it extinct. They had no record of any previous eruption. That previous eruption was unknown by them, having occurred around 1200 BC. Then, on 5 February AD 62, a violent earthquake reduced much of Pompeii to rubble. The level of damage was such that reconstruction work was still unfinished seventeen years later. It's likely that something was already happening to the mountain: a fracturing of the edifice by the movement of magma from the main chambers some five kilometres below the surface. But AD 62 was followed by a period of relative calm: the occasional quake as magma shifted further beneath the crust, but nothing on a comparable scale. On 20 August AD 79, however, major activity resumed with a series of quakes, increasing in frequency over the succeeding four days, as magma forced its way upwards into the feeder pipe of the volcano. Springs dried up around the mountain. 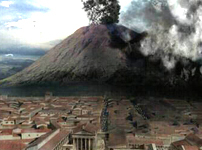 Finally, at approximately one o'clock on the afternoon of 24 August, Vesuvius exploded. The 'umbrella' - the spreading cloud at the top of the column - was driven south-east by the wind. Around half an hour after the explosion, around nine kilometres away, Pompeii was shrouded in darkness and began to be pelted by pumice. This 'Plinian' phase of the eruption lasted eighteen hours, at first gaining force as the magma ripped rocks from the side of the vent and as subsidence collapsed more of the rock carapace, creating a wide 'caldera' through which far greater masses of material could reach the surface. At peak intensity, the eruptive column reached a height of thirty kilometres or more as the mountain ejected 150,000 tonnes of material per second. Altogether, in the Plinian phase, an estimated 2.6 cubic kilometres of rock was blasted into the sky. The air-fall of ash, pumice and occasional rock fragments, accumulating at about fifteen centimetres an hour, eventually covered Pompeii to a depth of almost three metres. Many flat roofs caved in under the weight. Sometimes people sheltering beneath were killed. Outside, fugitives waded through loose pumice in the darkness, trying to make their escape, and a few unlucky ones were struck down by rocks, falling tiles or collapsing masonry. But overall the Plinian air-fall phase claimed few victims, and many hundreds were still stumbling around in a grey desert of pumice on the morning of 25 August. During the night the eruption had changed its form. The gas-rich magmas from the upper chambers became exhausted, and heavier magmas from deeper down began to reach the surface. The difference is seen today where layers of grey-green pumice overlie those of white pumice. There were also violent tremors. As the discharge of magma cracked and collapsed the rocks that were overlying emptied chambers, the shocks rippled across the bay. The land was shaken by earthquakes. The sea was sucked back and then hurled at the beaches in seismic tidal waves. These changes heralded the onset of the 'Peléan' phase of the eruption. When Mount Pelée erupted on Martinique in 1902, it released a pyroclastic ground-surge which travelled down the slopes of the mountain at a hundred kilometres an hour and incinerated the city of St Pierre, instantaneously killing all but two of its 28,000 inhabitants. Pyroclastic surge deposits - and closely associated pyroclastic flow deposits - form the upper layers of the Vesuvian strata at Pompeii. Six separate flows, amounting to twenty metres of volcanic debris, covered Herculaneum which, being five kilometres due west of the mountain, had suffered minimal air-fall. The pyroclastic phenomenon is little understood. Most likely, as the frothy upper magmas are spent and heavier lower magmas replace them, and as the pressure of the eruption reduces, the column of ejected material becomes denser, more unstable, and liable to collapse. It took perhaps five or six minutes to reach Pompeii from the lip of the crater: a dense, rolling, ground-hugging mass of gas, ash and rock (the pyroclastic flow), preceded a few seconds in front by a scorching blast like that from a flamethrower (the ground-surge). Walls were thrown down, columns toppled, tiles shot like cannonballs down the streets. At its hottest, where temperatures reached anything from 400°C to 800°C, the 'black cloud' carbonised wooden timbers, doors and shutters, and killed those it struck instantly, as brains boiled and skulls exploded in the flash. Others, where the heat was less, were asphyxiated as they breathed in hot gas and incandescent ash. This is how we see them still, captured at the moment of death, rigid in burn-shock and gasping for air. In the closing stages of the eruption, after the pyroclastic discharges, magma, and water mixed with explosive force, ejecting particles of fine ash and welding them together to form 'accretionary lapilli'. As these floated onto Pompeii, they moulded themselves around bodies and solidified, preserving the shapes of the dead after the flesh had rotted away. In 1863 the Italian archaeologist Giuseppe Fiorelli devised the technique for recovering these shapes by pumping plaster into cavities before the volcanic overburden was removed. By late afternoon on 25 August the eruption's force was largely spent, and by dawn the following day calm was fully restored. In the twenty-four hours-plus that the eruption had lasted, it is estimated that Vesuvius had unleashed thermal energy a thousand times greater than that of the atomic explosion at Hiroshima. The result was the obliteration of a large chunk of ancient Campania. Towns like Pompeii were never rebuilt. Eventually even knowledge of where they had lain was lost. How many escaped? We do not know. 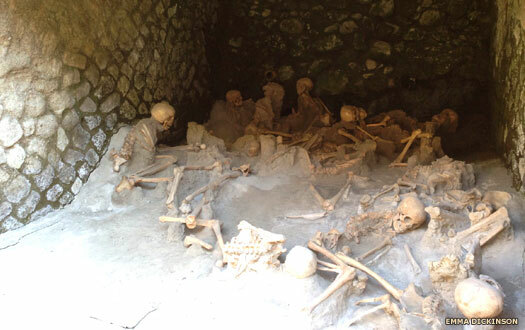 The people of Herculaneum, once thought to have escaped, were found in excavations on the ancient waterfront in 1980, huddled on the beach and in boatsheds – hundreds of them, where they had died trapped between a seismic sea and a burning gas cloud. As for the Pompeians, though most had clearly left the city, did they in fact survive, or are the roads south clogged with the bodies of refugees felled by pyroclastic surges? 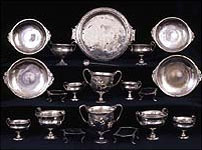 Images (where unlabelled) and text copyright © Current Archaeology. No breach of copyright is intended or inferred.